We have been asked to give everyone a helping hand to get to the fight, so for the travelling fans, here it is! Chris, Paul and Oisin are looking to put on a show in front of their fans, so come and add to the occasion! BY AIR: Chester is serviced by flights to Manchester and Liverpool and flights are available from www.ryanair.com. We found return flights from £70 flying out Saturday and coming back on Sunday. Also, for those driving, Chester is around 90 Minutes from Holyhead, which can be reached by boat services from Dublin Port and Dun Laoghaire. ACCOMMODATION: Rooms are available on www.laterooms.com from just £45 for the night of the fight. Local hotels can be found on “Hoole Road” which is around a 10 minute walk from the arena, although there are many other hotels in the local area. However, hotels will start to fill and prices will go up, so book early! THE VENUE: The Northgate Arena is centrally located and 5 minutes from Chester railway station – Click HERE for a local map. FIGHT TICKETS : If you are local and looking to buy tickets, you can contact Chester Boxers who are selling tickets directly. Details can be found HERE. You can also contact Oisin directly for tickets. This is a fight we have waited for, we’ve come close before but now is the time! 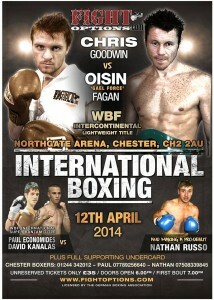 Fight Options will also be uploading an exclusive video chat with Oisin soon so keep an eye out for that. Oisin was in great spirits and is looking forwards to providing his fans with a night to remember, and adding a “signature” win and another title to his list. Don’t miss it!